Prior to the historic preservation movement that arose, mainly, in the 1970s, few older homes were saved when developers came in to create new shopping areas, parks, and neighborhoods. Before communities recognized the architectural gems of old, the innovations of new were already standing where homes had fallen. While historical home moving is the right approach to preserve many wonderful treasures of architecture, it is important for people to understand the issues involved. Only certain homes are candidates for structure relocation. The reasons for this are simple. Homes that are in serious states of disrepair, have little to no financial or historical value, or have not been kept pest free should not be considered feasible structure relocation candidates. To determine whether or not your structure can be safely and effectively moved, it is a good idea to arrange a consultation with professional home movers, especially those specializing in historic properties. Once it has been determined that your historical home moving can be done efficiently and safely, it is important for you to begin removing all furnishings and non-stationery fixtures. These things can cause damage and become damaged during the move. Professional movers can be hired to help transport these to the new location. When placement is of historic significance, it is a good idea to map where the items were placed in the house before moving them. Often the cost of moving small structures is paid upfront in cash, but certain large structures require financing. This can be tricky because homes need to be paid for before they are moved, but financing institutions cannot hold them in security until the house is safely relocated. This often leads to severe but potentially temporary cash flow problems for the people who have requested the move. Although there are some issues to consider when engaging a company for historical home moving, the benefits often outweigh the detriments. Once the home is in its second generation, you should be pleased with what you have accomplished for preservation. 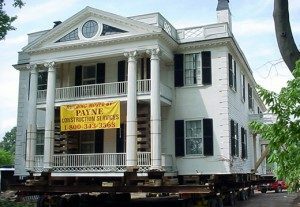 Need help with a historical home move? Contact our team at Payne Construction Services today! Click here for a free quote.